Inside Le Grand Palais, Kris Van Assche continued the celebration he kickstarted in FW17. Glimmering black vinyl fringing hung from the ceiling dangling just above guests’ heads, and turf had been laid underfoot. Garden party or outdoor rave? We’ll get on to that high-brow/low-brow tension later on. First, why the celebration? 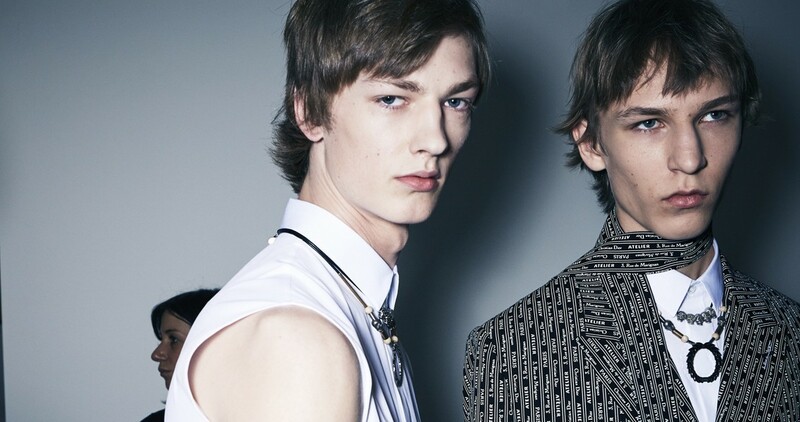 2017 marks Van Assche’s tenth year at the storied fashion house. Yes, ten years. It’s an impressive milestone, and even more so when you consider how much energy and anticipation his collections continue to inspire. 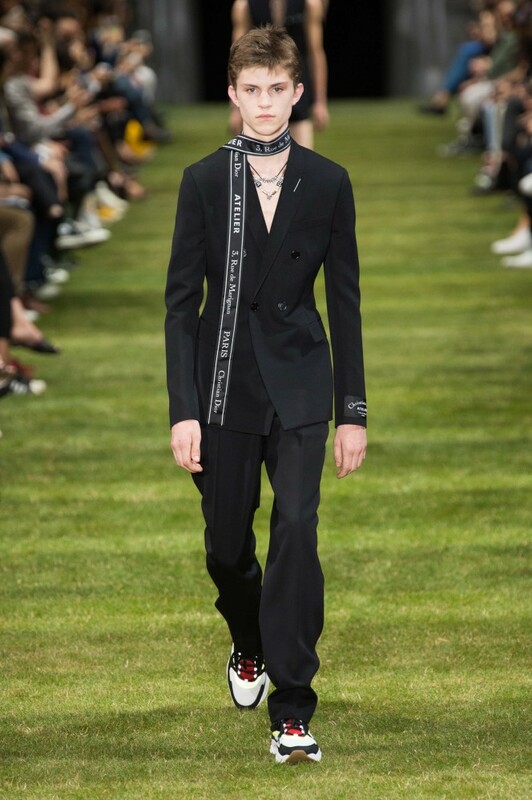 In January this year, Van Assche presented his techno-inspired FW17 ‘Celebration’ collection, re-imagining classic Dior shapes filtered through today’s youth zeitgeist whilst posing the question: how can you update tailoring in tune with today’s man? 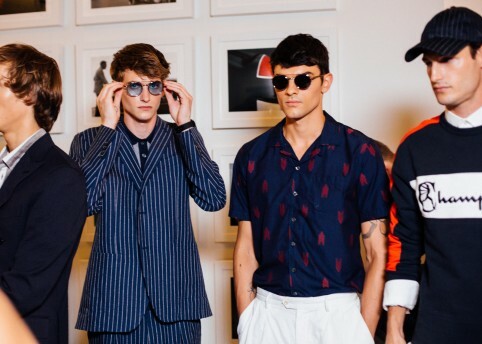 It’s a question that must still be playing on the designer’s mind, as SS18 saw him expand his answer. 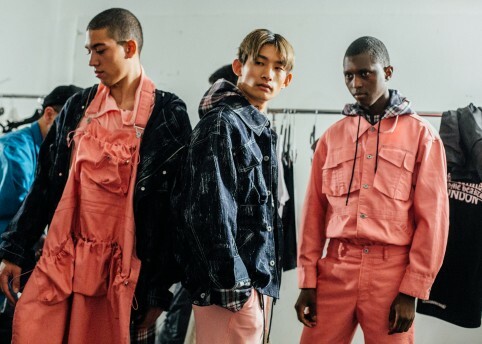 Previewing the show, Dior Homme released a series of exclusive images and videos offering a behind-the-scenes look at the house’s acclaimed atelier. Here was our first clue of what was to come. 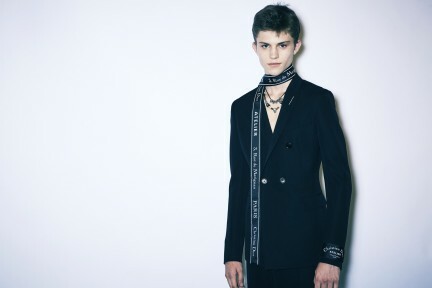 An homage to Dior’s iconic tailoring history, from the first look (a black ottoman wool double breasted blazer in a relaxed fit, paired with the Dior Homme atelier address ribbon worn as a scarf), Van Assche set out his stall. Here was an exercise in tailoring, a session in deconstruction and reconstruction: you have to learn the principle design codes before you can then shift the co-ordinates. 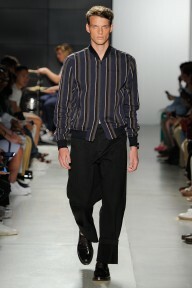 And that’s exactly what Van Assche did. As models appeared, that opening blazer look subtly altered. Sleeves were removed to create a gilet, and then narrowed to waistcoat proportions, whilst trousers got a similar treatment, from wide-leg they were then cut above the knees, before reverting back to full-length but in varying volumes. One look even saw the designer invert the stitching to the outside of the suit, appearing like surgery string. 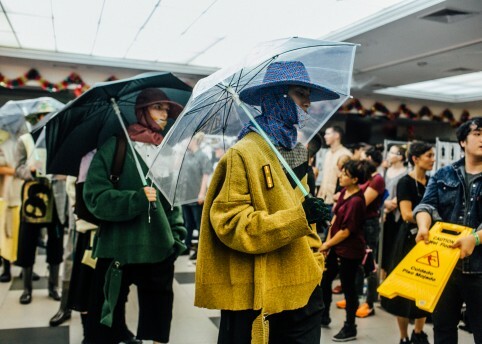 That balance between tension and friction is a constant feed for Van Assche’s work, supercharging Dior’s structured tailoring with subcultural codes. 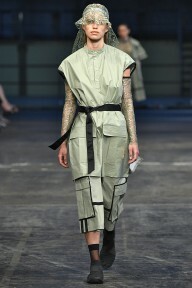 Subtly, the designer began to splice formal and sports codes; atelier address ribbon appeared as ribbed athletic stripes and along taped edges, varsity elements were fused with fine suiting, and trousers widened to become cargo pants – paired with a black ‘Cristian Dior Atelier’ sleeveless shirt it created a look that wouldn’t look out of place under Berghain lights. Wearing retro trainers on their feet, models were prepared to dance the night away. And red and white ‘PARIS’ sleeveless sweatshirts were an ode to France in a time of political progression; Van Assche is a public supporter of France’s new President Emmanuel Macron, who achieved an incredible parliamentary win last week. Hooded portraits by Parisian artist François Bard injected vivid colours across shirts. As an artist who employs a traditional, classical style of oil painting but applies it to contemporary subjects found in the media, you can see why Bard appeals to the Dior Homme designer, who takes his own cultural cues. 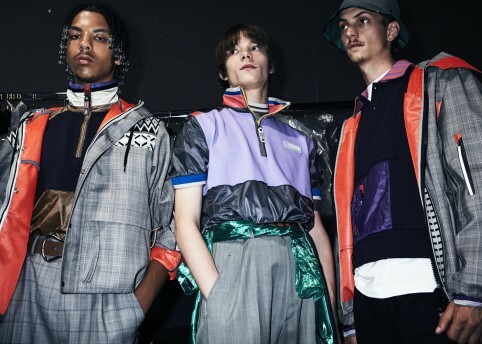 Van Assche’s message was perfectly in sync with the rave theme that has been a recurring reference point throughout this season – from Charles Jeffrey to Art School through Comme Des Garçons’ glitz party the previous day. Perhaps it’s a rejection of today’s political rot, or maybe it’s just because that’s what youth is all about: pure hedonistic enjoyment. As an ultimate mash-up of Radiohead’s Creep (perhaps Van Assche had been glued to the band’s epic Glastonbury headline set the previous night) and Depeche Mode’s Enjoy the Silence soundtracked the finale, Dave Gahan’s lyrics read our minds: “All I ever wanted, All I ever needed”.